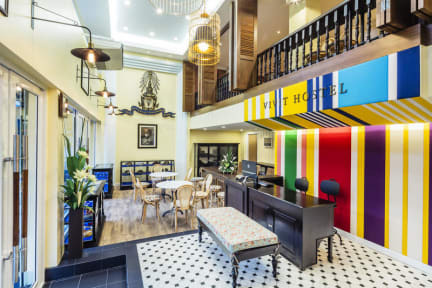 ‘Vivit Hostel Bangkok’ is one of the highest-rated hostel in the city, offering a relaxed and warm atmosphere for you to recharge in after a long day. It is set in the preserved heritage building “Vivit Busagar”, once home to the traditional tailor shop which have been serving the Royal Household since 1967. 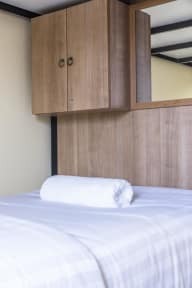 The hostel offers impeccable service and all essential amenities including a kitchen, a laundromat, 24-hour reception, and free in-room wifi. They are known for their premium beds which are widely recognized to be one of the most comfortable in the business! I don't think I can say how much I enjoyed my stay at this hostel! I love quite and relaxed hostels such as this one (I'm not much of a party person) and the atmosphere here was great. All the members of staff were super kind and helpful, always happy to give advice. Both dorm and toilet were immaculate (they also provide a complimentary towel). The hostel is located very close to the gran palace and the golden mount, and everything else is reachable by taxi or tuktuk. I totally recommend it! I really loved this hostel! Try the spa they suggest: it’s amazing!